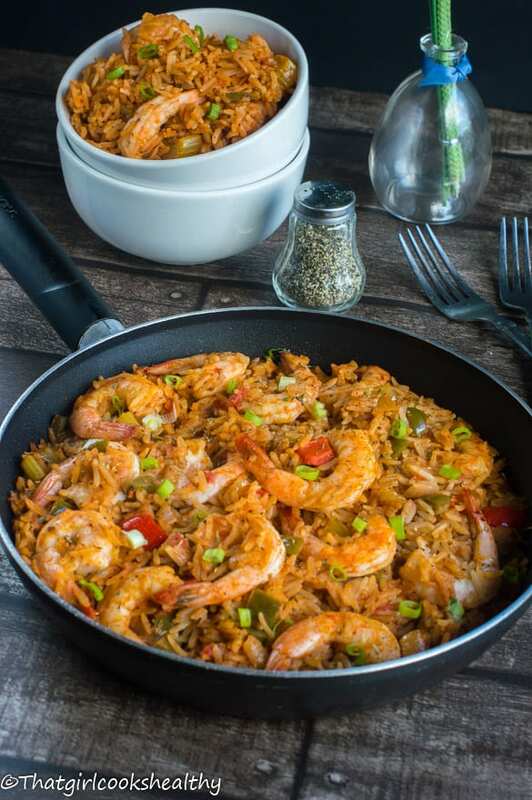 If you enjoy a bit of heat and well seasoned food, then this creole shrimp jambalaya cuisine couldn’t be more timely. I’m a huge fan of southern food and as a traveller I’ve had the luxury of sampling the real deal. This was a point in my life where I used to travel more frequently than I do nowadays and I wasn’t as passionate about food as I am now. As a consequence, I missed many opportunities to learn about the foods of the places I visited. Don’t get me wrong I was always a foodie, though I didn’t immerse myself in food and drink until recently. Essentially Jambalaya is a one pot dish that consists of rice, meat and vegetables. The meat can include anything from sausage, usually smoked andouille, chicken, and/or seafood such as shrimp or cray fish. 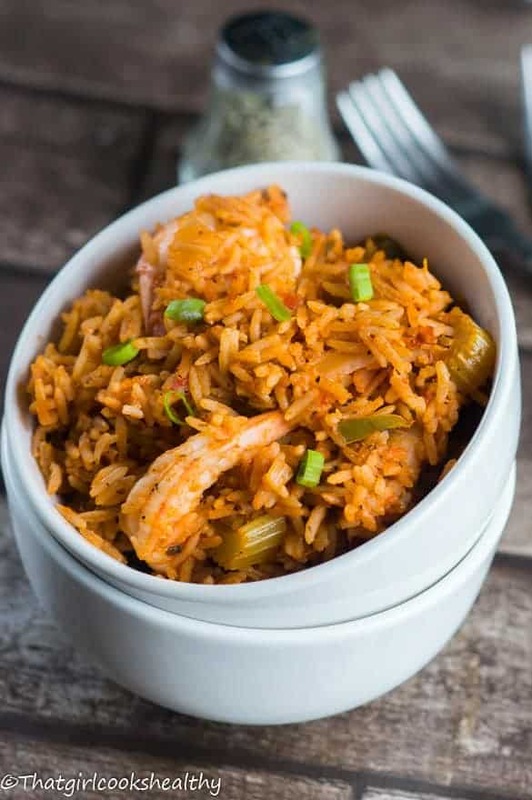 With that being said it’s hardly surprising that the word jambalaya derives from the French word for ham – Jambon and Aya is thought to be the West African word for rice. Jambalaya is like the southern version of Paella or Risotto, bearing the same wet consistently. There are a few versions of Jambalaya; Creole and Cajun. Creole (the one pictured here) sometimes referred to as ‘red jambalaya’ uses tomatoes. Usually the meat (sausage or chicken) is cooked first followed by the holy trinity (very important ingredient) which is celery, onion and green bell pepper. On a side note, I included red bell pepper in mine purely for color and a hint of sweetness. The holy trinity – what is it? The holy trinity is very similar to the latin America Sofrito, Haitian Epis and the English Caribbean island’s green seasoning. In short one would describe it as the base or should I say the foundation of the recipe and a very important step might I add. There would be no jambalaya without the holy trinity! Cajun jambalaya differs in the respect that is contains no tomatoes and the selected meat and veggies are cooked separately from the rice. 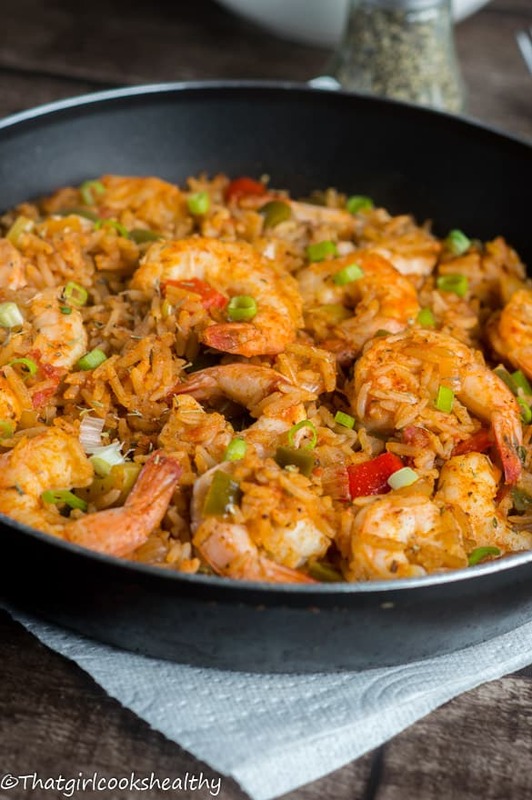 This version isn’t as popular as the creole shrimp Jambalaya and tends to be eaten namely in the rural parts of Louisiana. 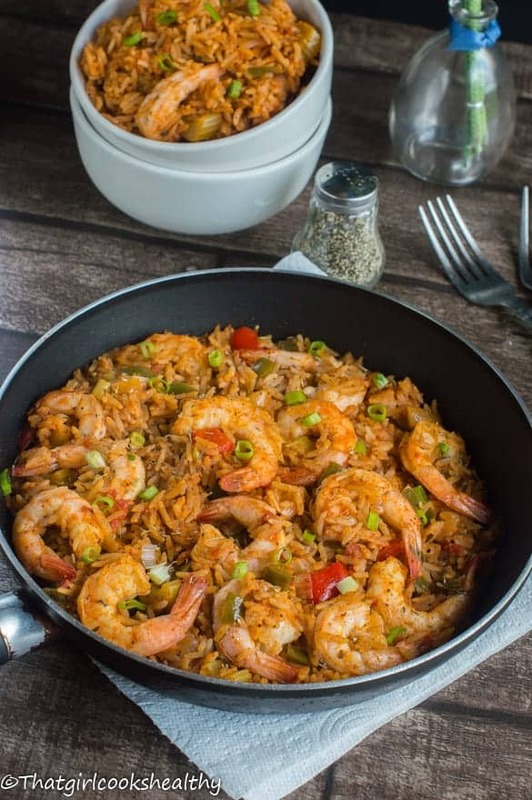 This creole shrimp jambalaya cuisine was well received by my family, they even went back for seconds and thirds (greedy bunch!) and Charla was left with none. I’m certainly not complaining as an empty plate is a good sign that the food was good, so why not share the recipe with you guys right? I used some of my Homemade vegetable stock and homemade creole cajun seasoning which offers some bold flavours. It’s quite powerful so I only used a single tablespoon and added the necessary condiments separately. I chose to be more meticulous to ensure the end result wasn’t overwhelming with potent spices or excess heat. If you like more heat that feel free to add another heaping more of the home made seasoning. Please keep in min this is strictly creole SHRIMP jambalaya – no pork or chicken. If you wish to add more poultry then adjust the seafood to meat ratio accordingly. 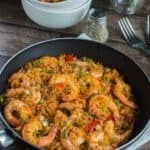 What shrimp to use for jambalaya? For best results I would advise to use raw jumbo/medium sized shrimp because it’s so easy to overcook shrimp. The texture of shrimp is very changeable should it be overcook – rubber and tough, not nice! It’s also best practice to add the shrimp towards the final stages of cooking (as per recipe) again to sure perfection. I used a total of 2lbs worth of raw shrimp. If you want you can use cooked shrimp, but as mentioned earlier add them a minutes to the end of the cooking stages. Frozen or fresh shrimp works well with this recipe. Heat the pan on medium with the coconut oil. Add the holy trinity – bell peppers, chopped celery and onions. Saute the holy trinity for 5-6 minutes until the onions are translucent. Pour the tomato/puree into the pan then season with the garlic powder, cayenne, paprika, oregano, black pepper, thyme, bay leaves along with the cajun seasoning. Stir until all of the veggies and herbs are well blended. Add the stock and bring to a rolling boil. Reduce the heat to low and simmer for approximately 50 minutes, covered. During the given time the rice will absorb the liquid, feel free to adjust your level of salt according to taste. Remove the lid then finally fold in the shrimp and allow the jambalaya to cook for a further 5 minutes or until shrimp is slightly pink in colour. You know, I’m the same as you! There was a time before I was passionate about food that I feel like I missed some great opportunities to pay more attention to things when travelling. 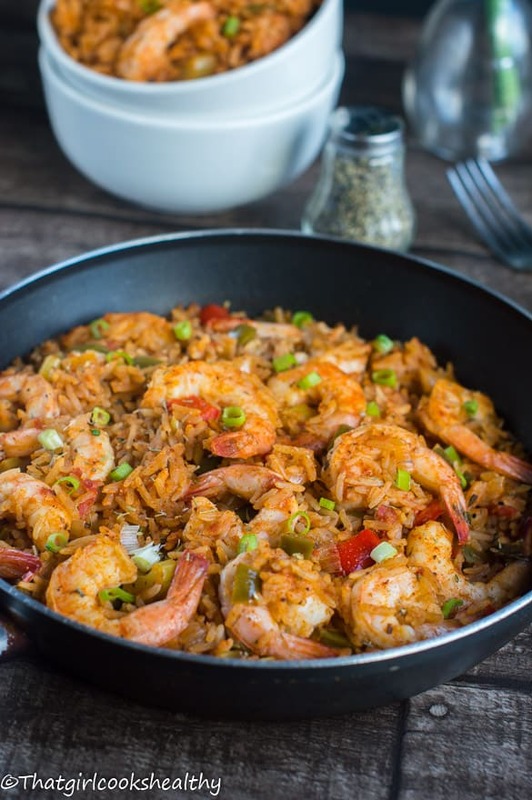 This shrimp jambalaya, looks wonderful and I can imagine how great the flavours would taste. 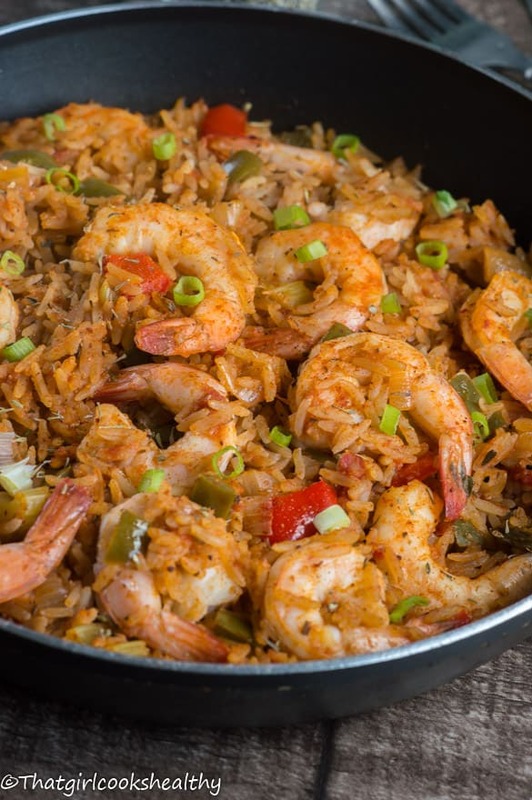 My husband loves jambalaya of all sorts … just the word starts him drooling!! It’s a dish that is so full of tradition and flavor, who doesn’t love it?! Thank you for commenting Noel. I think any meat or seafood lover would be a huge fan of jambalaya. Having just visited NOLA, and I eager to give your recipe a try. Looks absolutely delicious. Thank you! I hope you enjoy it as much as my family did. Yay! Glad I can assist you and yes please do let me know how the recipe turns out for you. I want to make this shrimp jambalaya for a trim the tree party for 6. How many servings in your recipe? Hi Heather. I’m just in the process of updating servings per recipe. This recipes serves roughly 4 peopl. If you want to stretch to 6 I would suggest adding 1/2 cup extra of rice and 100g more of shrimp. The other ingredients are fine as they are!